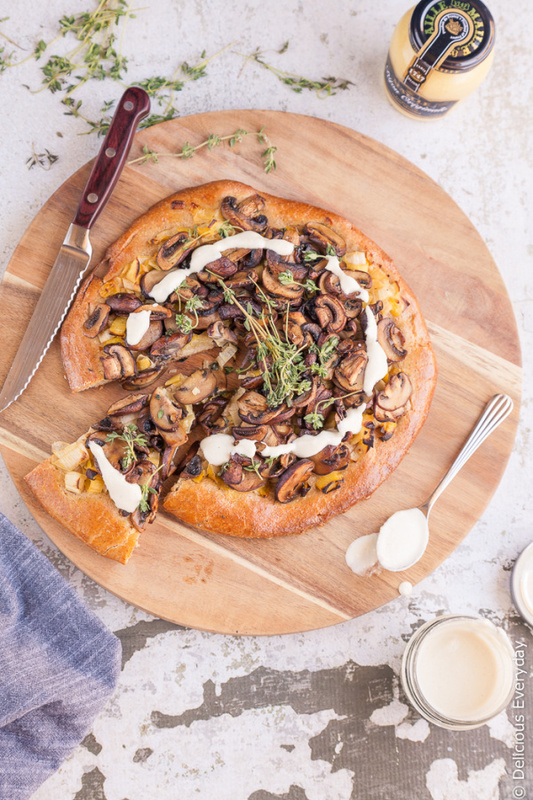 This Mushroom and Leek Brioche Tart is a lovely dairy-free vegetarian cross between a pizza and a tart, and a lot more decadent! Make mini mushroom tarts to kick start your holiday season parties. Mustard is one of those essentials I always have in the fridge. With it, I know that a good salad dressing is only a few moments away, and a delicious meal is not far away either. Maille is one of my favourite mustards, so I was only too happy to collaborate with them to bring you a delicious mustard recipe suitable for the holidays! 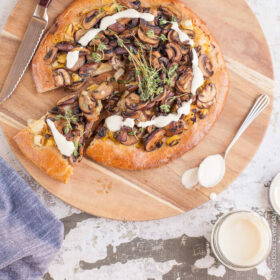 One of my favourite flavour combinations is mushrooms and mustard, and my Mushroom and Leek Brioche Tart ticks all the flavour boxes for me! My dairy-free brioche uses olive oil in place of butter, and I’ve added a touch of rye flour for a lovely rustic nutty touch. Topping the beautiful brioche base are sweet leeks, cooked slowly until meltingly soft in a bath of white wine and Maille Dijon Mustard. The leeks are topped with golden mushrooms, fried over a medium high heat to bring out their natural umami, and finishing it all off is a swirl of mustard cashew cream. 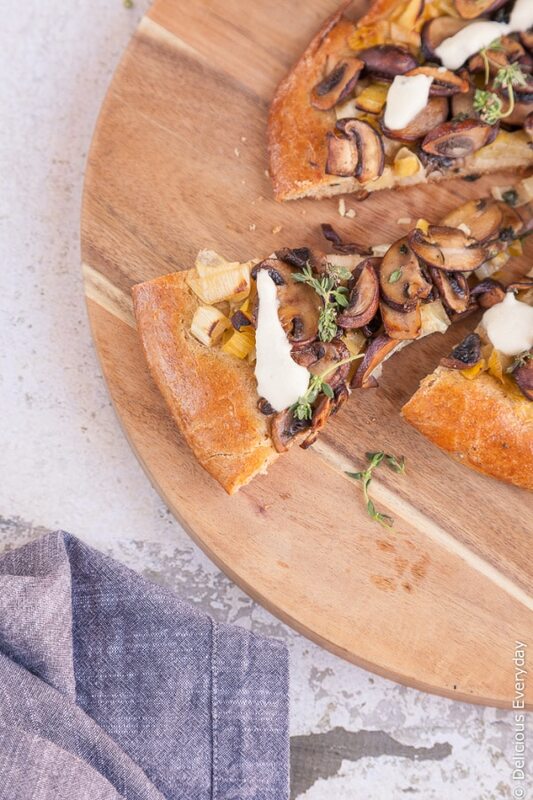 The result is an amazing mushroom tart that looks a little like a super posh pizza that is oh so good. So good in fact you’d forget there’s not a shred of cheese or dairy involved! The wonderful team at Maille Australia are offering 1 Delicious Everyday reader a $100 gift basket of Maille goodies this Christmas. Leave a comment below that begins with “Magical Maille Mustard” and tell me what you’ll be making this Christmas with mustard. 2. Share a photo of one of dish featuring Maille Mustard and begin your caption with “Magical Maille Mustard” and tell me why you’d like to win the $100 Maille gift basket. You must also tag @deliciouseveryday and use the hashtags #deliciouseveryday and #MailleAustralia. This competition is open to Australian residents only and ends on December 19. The winner will be drawn and announced on December 21. Subscribe to the Delicious Everyday weekly newsletter. It’s FREE! As a subscriber bonus, I’ll also send you my guide to pantry essentials for delicious everyday meals. Place the yeast and milk in a small bowl or cup and stir to dissolve yeast. Leave for 5 minutes or until foamy. Add the flour, eggs, yeast mixture and sea salt to the bowl of a stand mixer fitted with a paddle attachment and mix until the dough comes together. Switch the paddle attachment for a dough hook and knead, gradually adding the olive oil, a tsp at a time, allowing the oil to become fully incorporated before adding more. For a little bit it will look like a hot oily mess, but stick with it, the oil will mix into the dough with a little patience. Knead for 10 minutes or until the dough smooth and elastic. Cover dough with a tea towel and leave in a warm place for 1½ to 2 hours or until doubled in size. Knock back the dough and place on a tray covered with baking paper that has been lightly floured. Press down and use your fingers to shape into a rough circle. Lightly brush the top with more oil and cover with a tea towel and leave an hour or until doubled in size. While the dough is rising preheat the oven to 220 celsius (425 Fahrenheit) and cook the toppings. Place a frying pan over a medium-low heat. Split the leek in two lengthways and slice roughly 1.5cm (1.2 inch) thick. Add half the olive oil to the pan and gently fry the leeks until soft. Add the garlic, salt and white wine and bring the pan to a simmer before reducing the heat to low. Simmer until almost all of the wine has been absorbed. Remove from the heat and add the Dijon Mustard and stir well to combine. Place another frying pan over a medium high heat. Add the remaining oil and the mushrooms and cook until lightly golden. Season with salt and pepper and add the thyme leaves. Stir well to combine and remove from the heat. Once the toppings have cooled top the tart with the leeks, leaving a border at the edge of the tart. Top the leeks with the mushrooms and brush the edges of the tart with the egg wash. Bake for 15 to 20 minutes until the tart crust is golden and the underside of the tart is cooked. While the tart is baking make the cashew cream drain the cashews and place in a blender along with the water and mustard. Blend until smooth and season to taste. When you are ready to serve drizzle the mustard cream over the tart and serve. I love to see your creations on Instagram, Facebook, & Twitter! If you make this recipe, snap a pic and hashtag it #deliciouseveryday. This recipe was sponsored by Maille Australia. Thank you for supporting the sponsors that keep Delicious Everyday delivering free recipes to your kitchen! How is this dairy free if it has an egg in the recipe?? I’m sorry you were disappointed by the addition of eggs, however, eggs are technically not dairy, despite the fact they are found in the dairy aisle. See this and this. The reason I specify dairy free is there are some people, such as myself, who can’t tolerate the lactose in dairy items such as milk, yoghurt, cream and cheeses, and this recipe contains none of those. Magical Maille Mustard makes a boring sandwich delicious, a boring sauce special, and makes many dishes more interesting. I love Maille mustard with cream as a sauce for my steak. For Christmas I’ll be making a delicious salad dressing with olive oil, balsamic vinegar, salt, garlic and a teaspoon of Maille Dijon mustard. Perfect for the Christmas lunch of ham, chicken, salads and bread. I can’t wait! Magical Maille Mustard transforms a regular Christmas ham into a gourmet delicious family tradition. Simply combine Maille Wholegrain and Dijon Mustards with some Tasmanian Leatherwood Honey, a great quality Marmalade, a pinch of salt, freshly ground black pepper and enough boiling water to turn it into a spreadable paste. Slather over a smoked leg of ham on the bone with 1cm deep cuts crossed into the skin studded with cloves and orange peel. Roast in a medium oven, basting regularly until the skin is glistening and the fat is rendered. Serve with duck fat roasted veg and wait for the recipe requests… Sit back and enjoy the Maille Magic! Magical Maille Mustard is my fave, especially the Dijon. I don’t use a lot of mustard in recipes, but I do love to pop it on toasted and open sandwiches and melts. I also add it to many salad dressings – a bit of EVOO, balsamic or white wine vinegar, Maille Dijon mustard and salt and pepper. Delish! Magical Maille Mustard! Yum this looks fantastic! This mustard would be perfect for my honey mustard glazed ham! 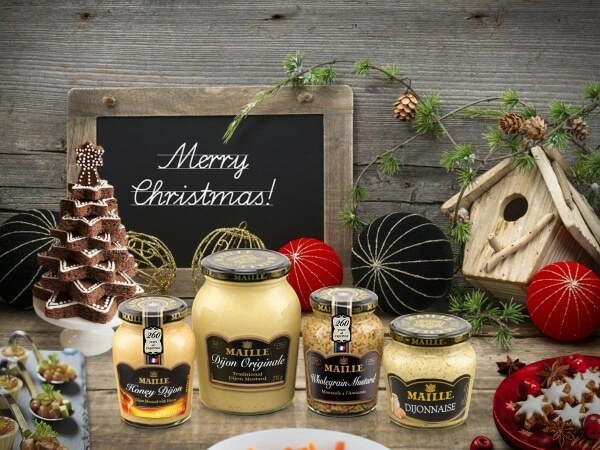 Magical Maille Mustard makes xmas magical and $100 worth of Maille would.make xmas a handred times more magical. A delicious looking tart! I love leeks and mushrooms. So tasty. Hi, love your page, all vegetarian ideas & recipes well received. I’ll be using mustard in my salad dressings, made with the basis of cashew nuts. Keep up the great vegetarian recipes.